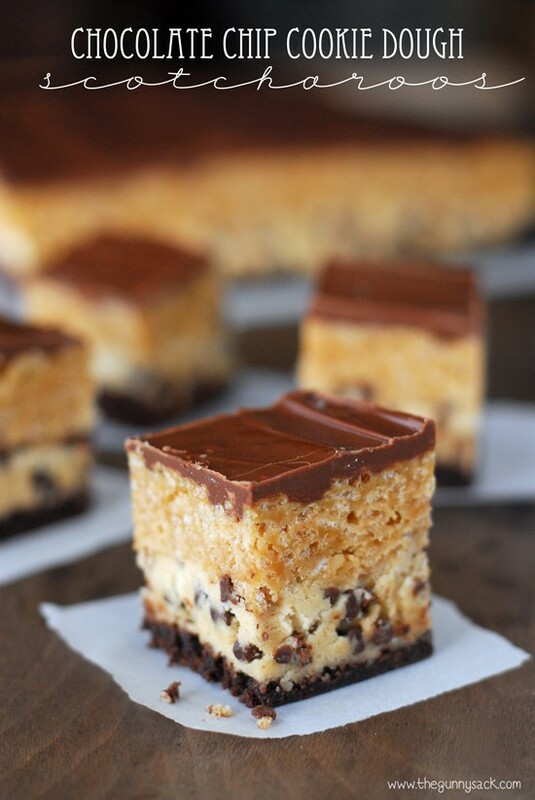 Chocolate Chip Cookie Dough Scotcharoos are an amazing cookie dough bar with layers of cake mix cookies and scotcharoos with eggless cookie dough in the middle! I wasn’t sure what to make for my second cookie dough recipe. I did some brainstorming and then looked online and found that all of the great ideas I came up with have already been made. That is totally fine and I could’ve come up with my own version, but instead I did some more thinking. 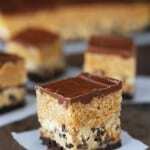 I decided that I wanted to combine chocolate chip cookie dough with another one of my favorite bars: scotcharoos. Scotcharoos are one of those easy to make recipes that are so good. I love the combination of chocolate, butterscotch and peanut butter. But still needed a third or layer for the bars and it had to be something thin but more sturdy. I settled on a cake mix cookie crust. 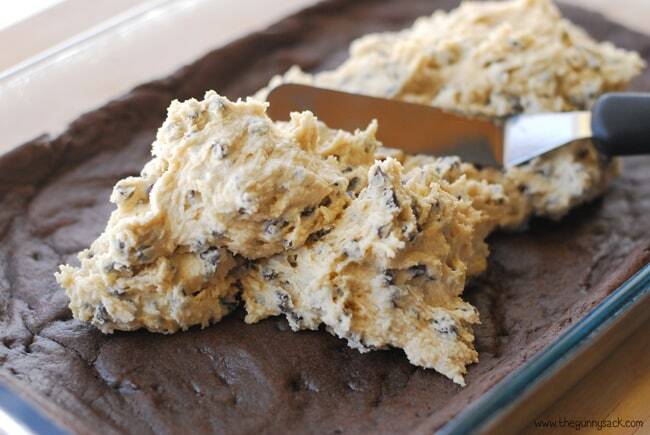 The combination of all three layers of these Chocolate Chip Cookie Dough Scotcharoos is delicious! The bottom layer is like a big chocolate cake mix cookie. When I took the pan out of the oven after baking, I was worried because the cookies raised to fill the pan. As they cooled, they flattened out and the weight of the other layers flattened them even more. To make the bottom layer, mix together a chocolate cake mix, eggs and oil. Spread into a greased 9×13 inch pan (line pan with foil if you want to be able to lift the bars out to cut them) and bake at 350 degrees for 12-15 minutes. 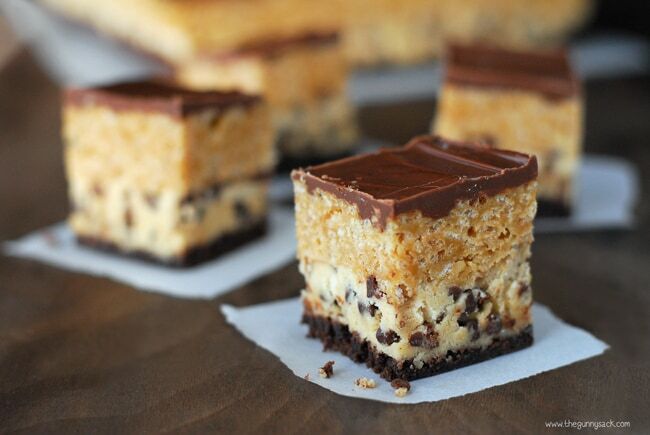 Place the cookie bars in the fridge to cool. Next, make the chocolate chip cookie dough. Cream together butter, granulated sugar and brown sugar. Add sweetened condensed milk and vanilla. Mix in flour and salt. Finally, add mini chocolate chips. 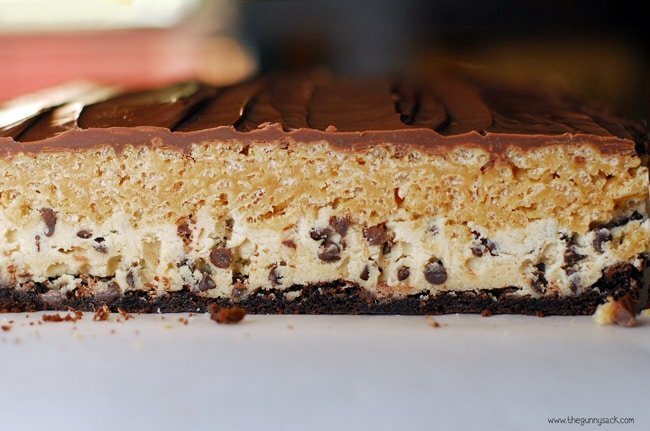 Spread cookie dough over cooled cake mix cookie bars and return to the fridge to chill. For the third layer, make scotcharoos. Heat light corn syrup and sugar just until it starts to boil. Remove from heat and stir in peanut butter. 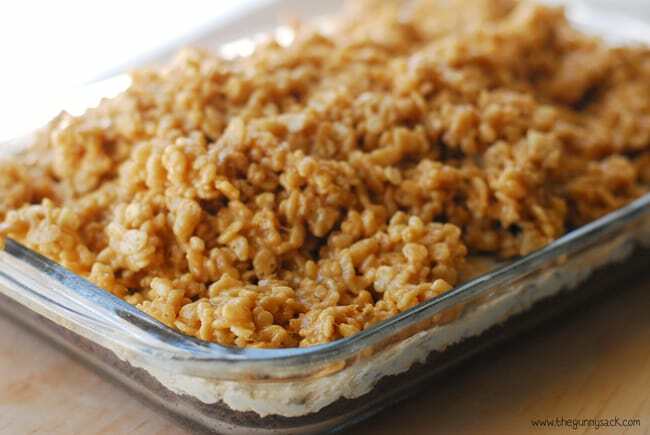 Pour mixture over Rice Krispies in a large bowl and mix well. Spread and press over the chocolate chip cookie dough. This filled my pan all the way to the top, but you can leave a cup or two of the scotcharoos in the bowl if they all won’t fit in the 9×13 inch pan. Microwave chocolate chips and butterscotch chips for 30 seconds, stir. Continue heating and stirring at 15 second intervals until smooth. Spread the chocolate over the scotcharoos. Place the bars in the fridge to cool and set. Cut the bars into squares once they’ve had time to harden. It is best to cut them right after they come out of the fridge, before the chocolate chip cookie dough has time to soften. These Chocolate Chip Cookie Dough Scotcharoos were too good to keep in the house. I brought them with us as we visited friends and family over the weekend and everyone raved about them so the recipe is definitely a keeper! Mix together chocolate cake mix, eggs and oil. Spread into a greased (foil lined if desired) 9×13 inch pan. Place the cookie bars in the fridge to cool. Cream together butter, granulated sugar and brown sugar. Spread cookie dough over cooled cake mix cookie bars and return to the fridge to chill. Heat light corn syrup and sugar just until it starts to boil. Pour mixture over Rice Krispies in a large bowl and mix well. Spread and press over the chocolate chip cookie dough. Leave a cup or two of the scotcharoos in the bowl if they all won’t fit in the 9×13 inch pan. Microwave chocolate chips and butterscotch chips for 30 seconds, stir. Continue heating and stirring at 15 second intervals until smooth. Spread the chocolate over the scotcharoos. Place the bars in the fridge to cool and set. I made these for the family thinking it was a quick and easy dessert (turns out it was harder than anticipated). I made a few substitutions, brownie instead of cake and Nutella instead of peanut butter. I put it in the fridge and when dessert time came, I broke it out. The guys were really excited when they saw the monster dessert. I made the mistake of cutting the pieces 3x3in. Huge. Huge. Pieces. None of us could finish and we all ended up in food comas by the end. Everyone loved it, however, it was extremely rich (my fault), next time I make it, I’ll definitely use the cake instead of the brownie. All in all, I would recommend this recipe. I think next time I make rice crispy treats I’ll use corn syrup and sugar and add Nutella again because the top layer was definitely the favorite. Thanks for the recipe! Do these need to stay refrigerated? I want to take a batch of them camping with me but am afraid they might not do well in the heat. Yeah, they will do better when they are cold. The cookie dough and the chocolate will get too soft. Maybe you could put them in the cooler? WOW. These look ah-mazing. So creative! This looks Awesome!!! My next cheat meal ( I’m a Fitness guy) will be this!!! Thanks for sharing these delicious recipes! Keep it up! 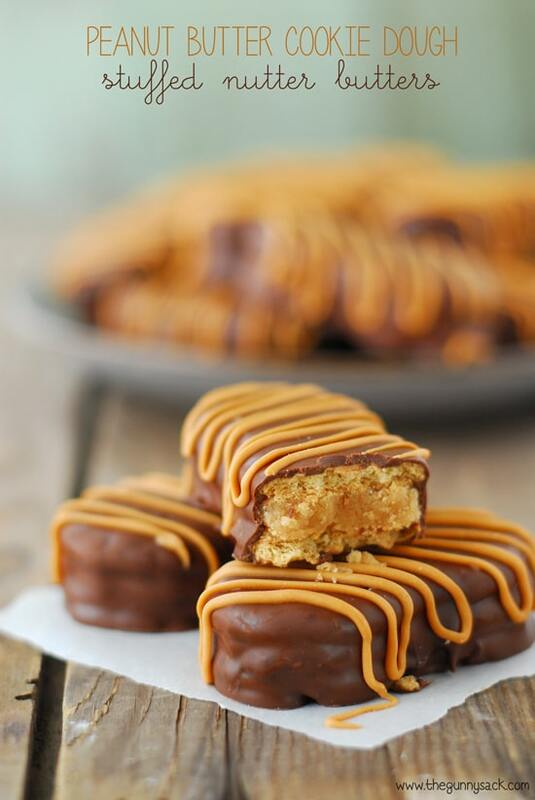 I LOVE scotcheroos, Tonia! And I can only imagine the addition of cookie dough makes them that much more amazing!! Me too! That combo of chocolate, pb and butterscotch is lovely. Thanks Cathy! Wowwwwwwww, his looks absolutely delicious!!! I need them all, It’s simply stunning picture also awesome recipe. If I become Obese, I am blaming this recipe! OMG, girl, these awesome bars (I can’t pronounce the name 😉 ) are making me drool!! Holy layers of yum!!! 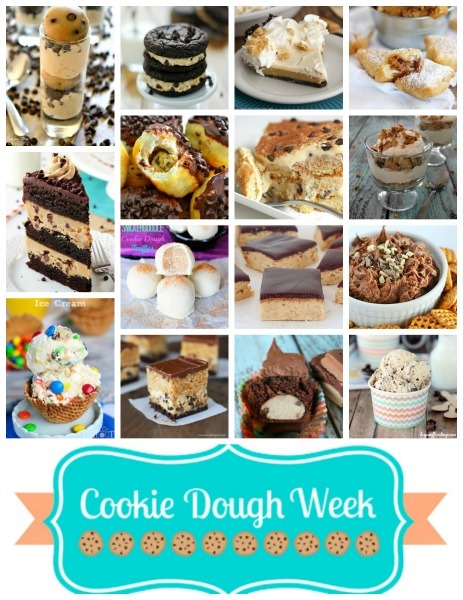 What a great way to incorporate cookie dough!!! I am dying over all the layers in this dessert! How fun! Thanks for participating!! I think I love these even more than the Nutter Butters and that is saying A LOT Tonia 🙂 Pinned! OMG Tonia. OMG. This is…the best thing EVER. I had a little trouble trying to figure out what to make as well. I think you found the perfect dessert! Those layers are beautiful! 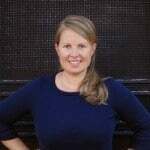 Tonia, I am in LOVE with your brainstorming idea! 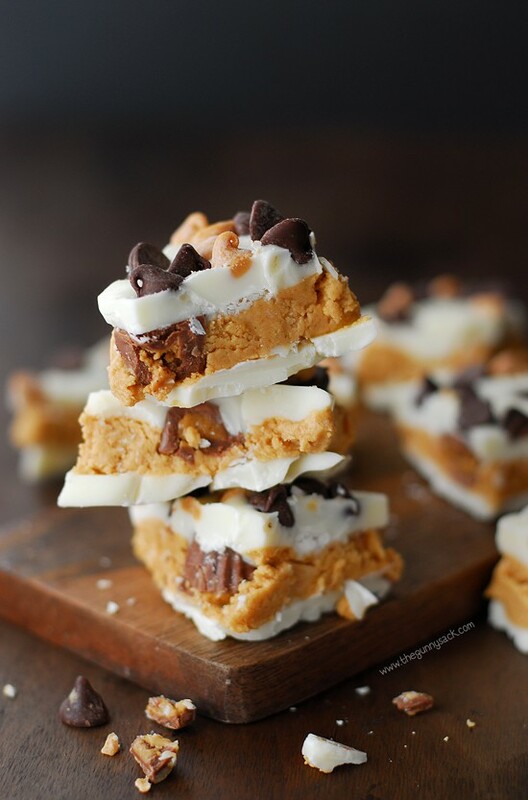 All of those layers of sinful goodness… I need to make this up very soon! Jaw = dropped. I am in LOVE with this unique and fun flavor combination, Tonia! And the texture of the smooth cookie dough + the crispy, salty butterscotch layer. AMAZING. WOW!!! This looks so amazing I can’t even stand it! I love seeing all the different food creations people come up with! These look so yummy!